January 28 2010 - Air New Zealand to offer on its Boeing 777-300 lie-flat economy seating on its international flights when it introduces revolutionary, Kiwi designed lie-flat economy and ground breaking premium economy seats, together with enhanced comforts for those wanting the ultimate in luxurious Business Premier travel later this year. Air New Zealand unrevealed its prototype designs in a full-scale Boeing 777-300 cabin inside its design innovation centre in Auckland's CBD, just a few hundred metres from its head office. Chief Executive Officer Rob Fyfe says when the airline takes delivery of its first new Boeing 777-300 ER in November this year it will redefine the long haul travel experience and set a benchmark for competitors to follow. "Air New Zealand is putting the magic and romance back into flying. For the past three years we have been designing a new long haul experience that will reignite the passion of today's travellers," Mr Fyfe says. "For those who choose, the days of sitting in economy and yearning to lie down and sleep are gone. The dream is now a reality, one that you can even share with a travelling companion - just keep your clothes on thanks!" The 'Skycouch', a specially designed row of three seats, has been engineered to create a lie-flat, flexible space all the way to the seat-back in front, providing a place for the kids to play, or the holy grail of economy travel - a flat surface for adults to relax and sleep. Twenty-two sets of Skycouch seats will be available, being the first 11 window rows in the Economy Class cabin. For two adults travelling, purchasing the Skycouch will be based on buying two seats at standard prices with the third seat at approximately half price. Full airfare details will be announced when it goes on sale from late April. Air New Zealand's Premium Economy cabin has also had a dramatic makeover. "Most airlines' Premium Economy offering leaves travellers with economy-style food and service. By complete contrast, our new Premium Economy cabin with uniquely Kiwi designed Spaceseats will offer unparalleled comfort and legroom with new shared-meal experiences more familiar in tapas restaurants or bistros than at 35,000 feet," says Mr Fyfe. Air New Zealand's award winning Business Premier cabin has also been enhanced with complete on-demand food and beverage service more akin to premium dining and an enhanced sleep experience to ensure travellers really do feel they've snuggled into their own bed. The new interior design scheme includes a move away from traditional blues and greens to a more luxurious blend of chalk and deep ink colours. Mr Fyfe says each of the three zones in Air New Zealand's long haul aircraft of the future will be a step ahead of competitors from a comfort perspective and the experience will be further underpinned by the world's most innovative food and beverage service and state-of-the-art entertainment system. "Being able to order a steak, medium rare in Business Premier, a pizza for two in Premium Economy or a late night snack in Economy, whenever you want, will be a very cool experience. New oven technology that will cook food from scratch rather than simply reheating and a new digital in-seat ordering service will make this truly the first time real food has been served at 35,000 feet. "Coupled with some of the world's best wines like gold-medal winning sauvignon blancs from Marlborough, pinot noirs from Central Otago and cabernet merlots and syrahs from Hawke's Bay, we will be serving an incredible dining experience!" The 340 seat 777-300 aircraft will be configured with 246 in Economy (including 66 seats creating 22 Skycouch combinations), 50 in Premium Economy and 44 in Business Premier. The first routes to offer travellers the next generation of long haul travel will be on selected NZ5 and NZ6 services between Auckland and Los Angeles from December followed by dedicated return services on NZ1 and NZ2 between Auckland and Los Angeles and through to London from April 2011. 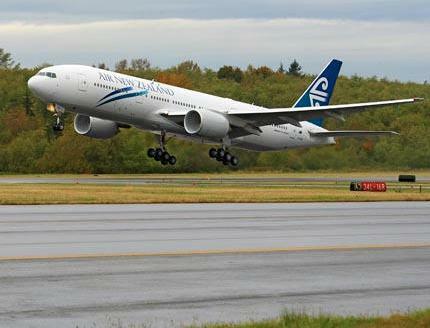 Air New Zealand expects to also refit its fleet of eight Boeing 777-200 aircraft from mid next year, with all Asian, North American and UK services to have the new product by around 2012.